Zumba, a latin inspired dance. The rhythm of Latin music just makes you want to move! The steps are very easy to follow and you will learn them in no time. 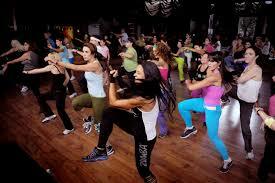 Zumba is a high energy class, perfect for the girls that don't believe in taking it easy. The class could certainly be described as a calorie-burning dance class! Athlone, Carlow, Carrick-on- Shannon, Cork, Dublin, Galway, Kilkenny, Letterkenny, Limerick, Longford, Mullingar, Sligo, Waterford, Wexford. Absolutely! We want everyone to join in and have fun. If someone can not participate in the actual class due to medical reasons or otherwise, they can still join us and be a cheerleader, take pictures, or simply seat down and enjoy the show.